These are Amitabha of 1000 bodies called the "1000-body Buddha". Amitabha of 1000 bodies called the "1000-body Buddha" are installed in the bottom of this. It is a figure of Ukimido temple seen from the precincts of a temple. ( Some wild geese which fly down from the sky in Katata)." Omi Hakkei are Eight Views of Omi made famous by Hiroshige's picturesque woodblock prints. 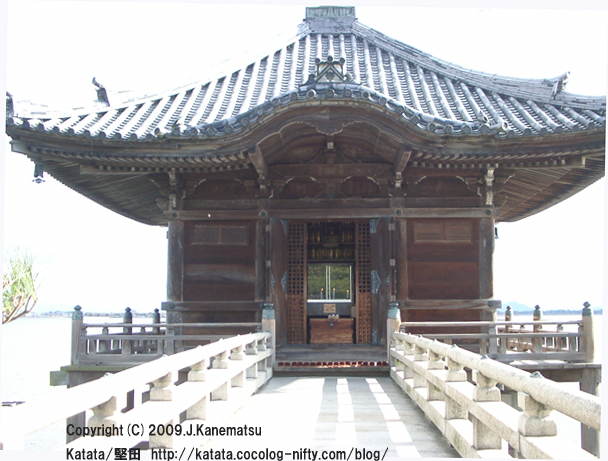 The formal name of Ukimido is a "Kaimonzan Mangetsu-ji temple." It is the Zen temple of Rinzai sect, it belongs to the Kyoto Murasakino Daitoku-ji Temple group. who was an author of "Ojyoyosyu (The Essentials of Pure Land Rebirth) ". He prayed the safety of passing on the Lake Biwa and the degree of creature, and built it. 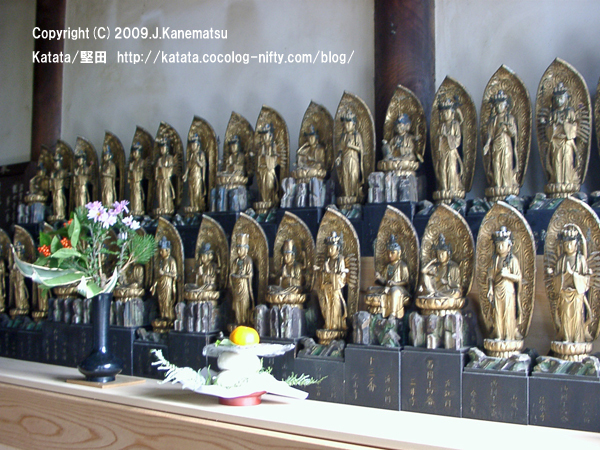 Amitabha of 1000 bodies called the "Sentaibutsu" are installed in the inside of Ukimido. Present Ukimi-do was rebuilt in Showa 12(1937). 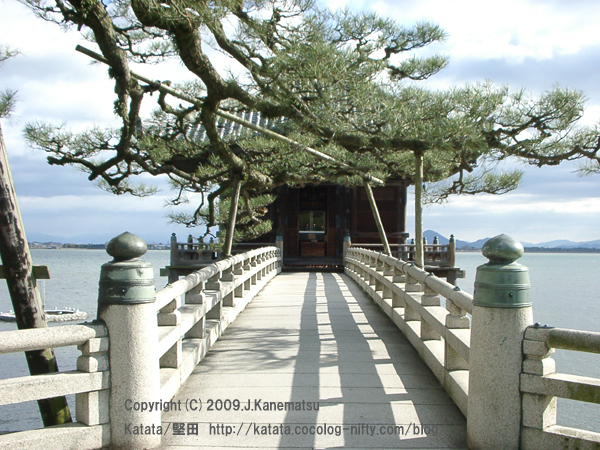 If it passes through this gate, there is Ukimido temple which appears on Lake Biwa. 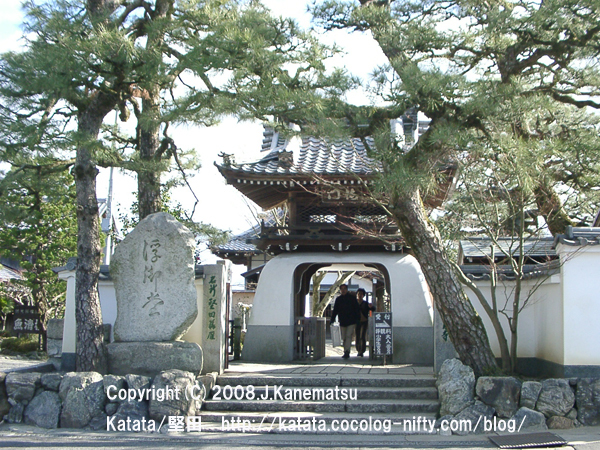 The gate is designated as the registration cultural property like Ukimido temple. It is the scenery of some stores in front of Ukimido temple. 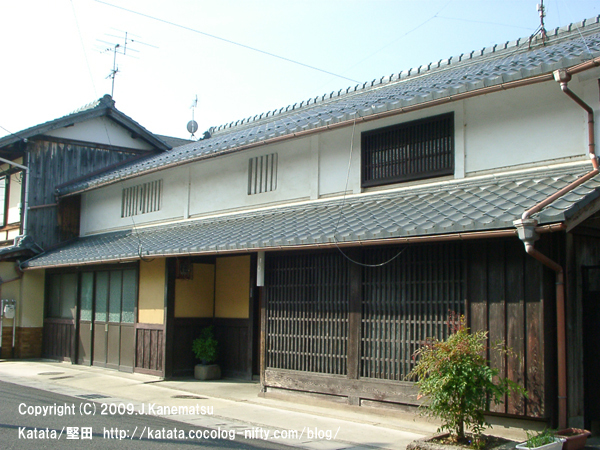 It is Museum of Katata (Kozokunosato-siｒyoukan) that it is in the middle of the rows of houses which continue to Ukimido temple. and sightseeing guidance.There are free parking and a public toilet in the other side to this museum. "Kozoku" is medieval Katata's town official and is expression which comes out to Eiji Yoshikawa's "New Heike monogatari." 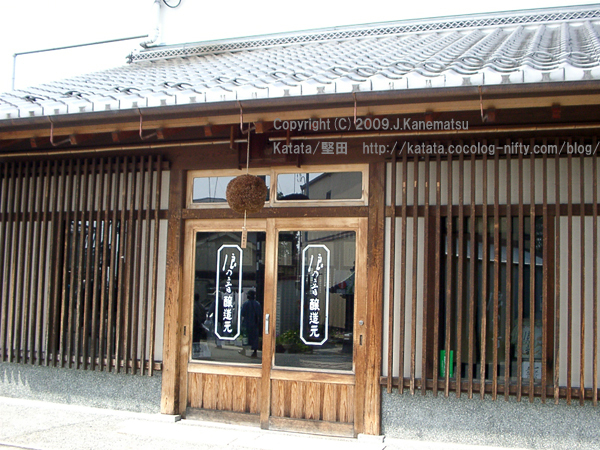 In Museum of Katata, the history of Katata and the person associated with Katata are exhibited by the panel. The literary work dealing with Katata and some old tools are also exhibited in the museum. The back number of the photograph of some exhibits is here. is carried out in Museum of Katata. The handkerchief and cassette tape of Tankai-busi were also sold at the museum. (Please ask Museum of Katata for details.) Others -- as a thing associated with Mr.Tankai Shiganoya , it is as follows. in Honpuku-ji temple near Museum of Katata. 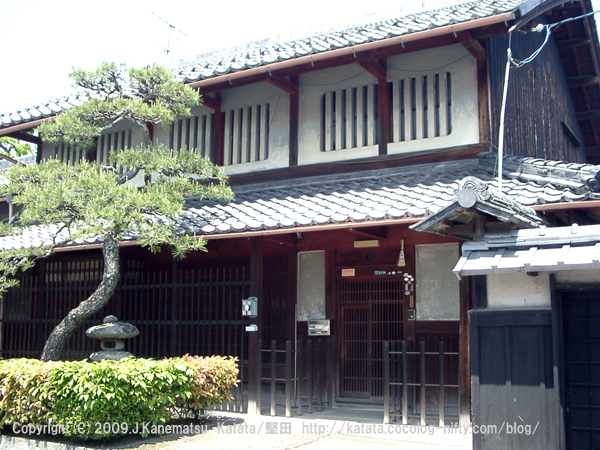 One of the private houses chosen as the "ancient city scene prize" of Otsu city, Shiga prefecture. This is a town house of the Meiji term. The pine which grows in a front garden, and the window called Mushiko-mado window of the second floor are characteristic. Mushiko-mado window means the latticed window of the mortar coating prepared in the second fl oor that faced the passage. 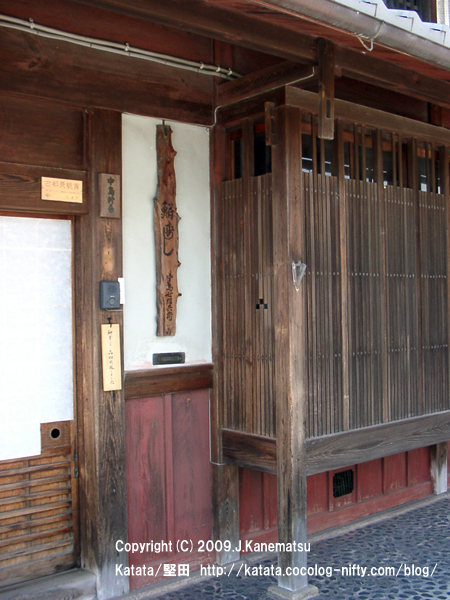 It is a window for fire prevention and crime prevention, and is often seen to Machiya in Kansai centering on Kyoto. The yellow car of City of Otsu is just going to run. with a Katata town loop-line bus from JR Katata station. 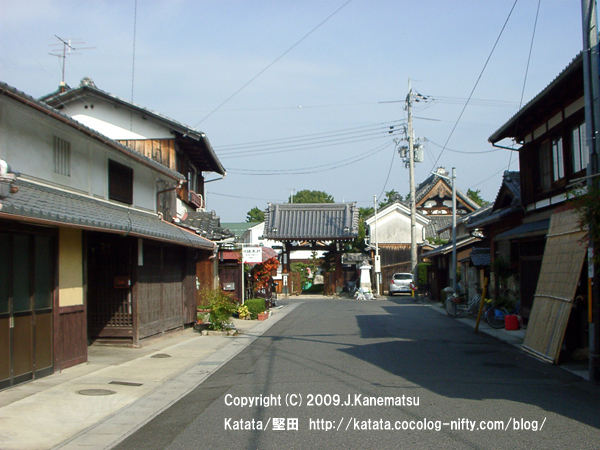 the calm rows of houses in which Machiya of the Meiji term remains continue. 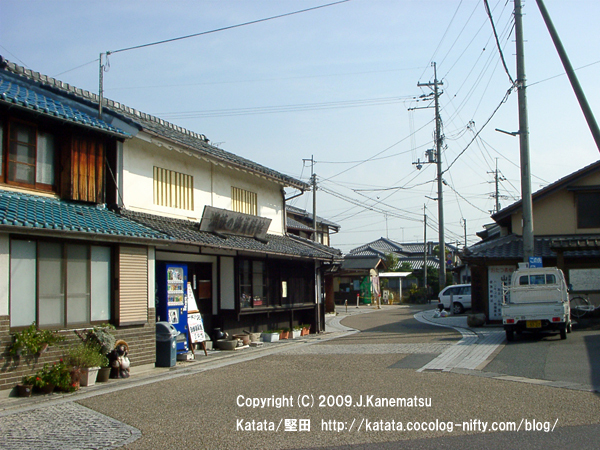 It is the area which Machiya chosen as the "ancient city scene prize" of Otsu city is concentrating. 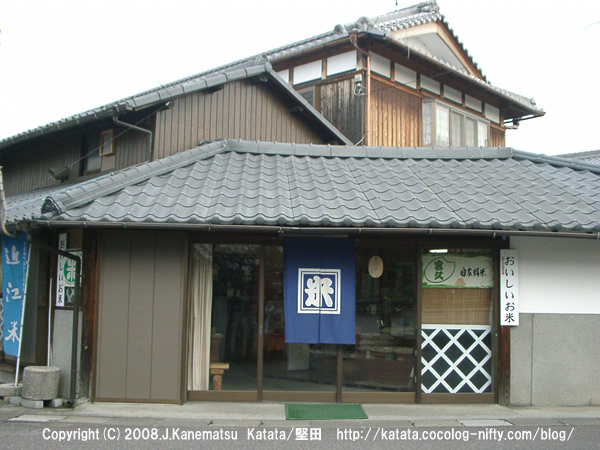 Speaking of the Ukimido temple front, it is the Uotomi store which is the specialty store of the food using the fish of Lake Biwa. Some kinds of tsukudani（※） are sold at this store. An eel is also sold in summer.And Funazushi(※) is also sold in winter. It seems that there are many people who buy Tsukudani at the Uotomi store after visiting to pray to Ukimido temple. The photograph of the tukudani of young sweetfish which I bought before is here. 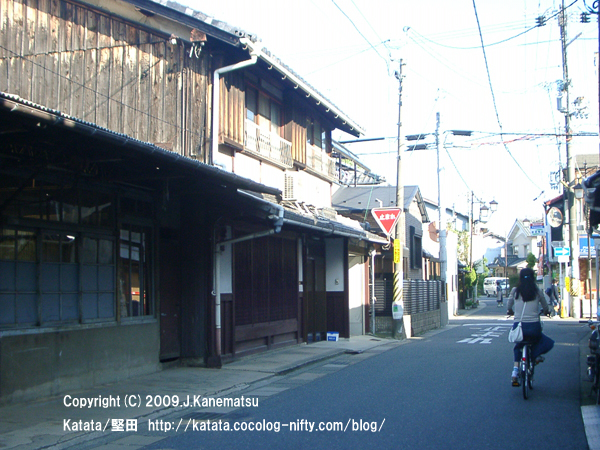 (in present-day Chūō, Tokyo) where it was first made in the Edo period. Many kinds of tsukudani are sold. Traditionally made tsukudani is preservable and has been favored as a storable side dish in Japanese kitchen since the Edo period." 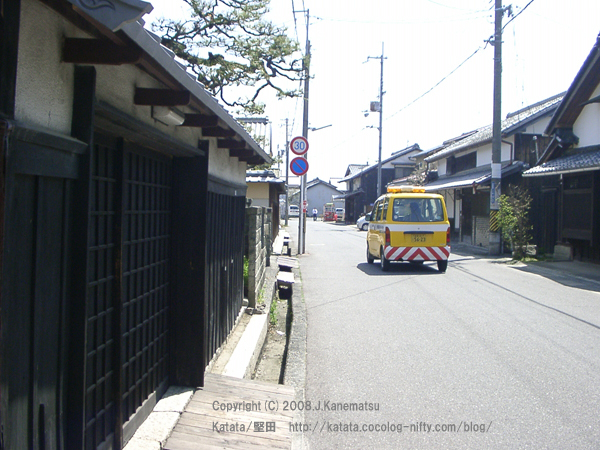 that it is in the residential street in the inner part of the Kanda shrine. "Nami-no-Oto" is Japanese sake of the reputation made in Katata and there is deep-rooted popularity. 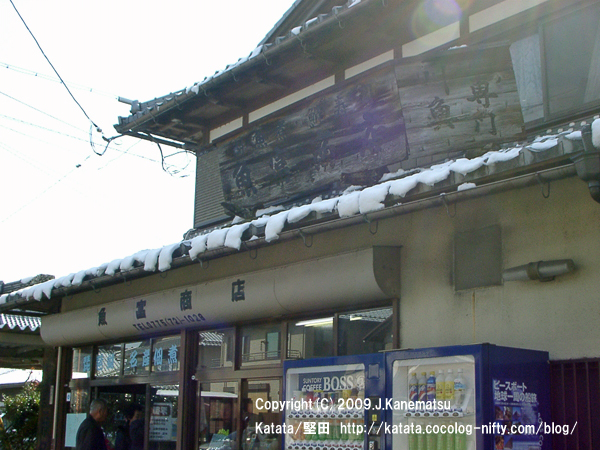 It is " Miyakyu " of a rice shop that it is on the way from the Katatademachi to Ukimido temple. 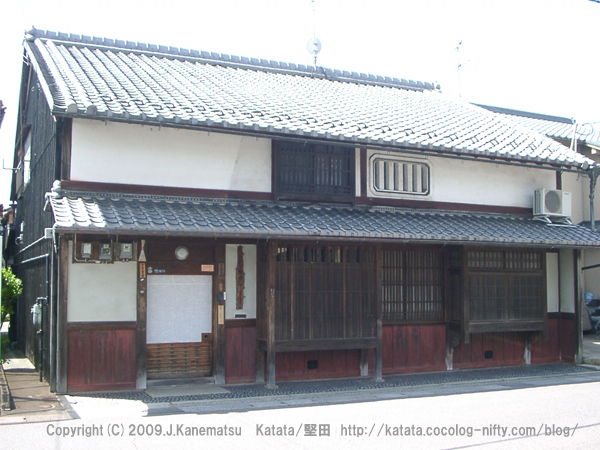 It is the store which is in the other side to Myousei-ji temple, and has the calm appearance. 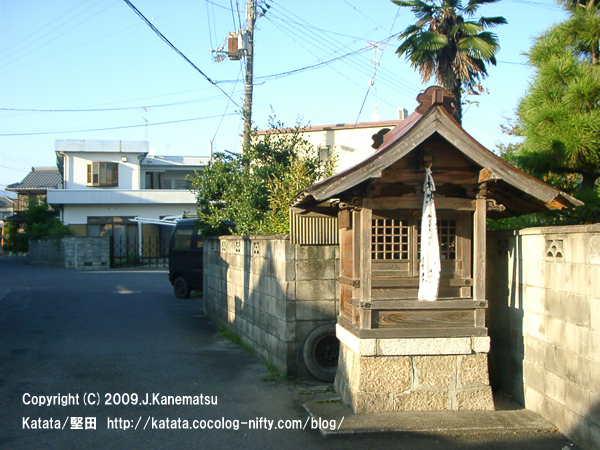 If you walk in the direction of Ukimido Temple from the Katatademachi, the row of houses continue. A funazushi shop called Mr. Nakajima is in the Honkatata 1 chome. Modification construction of this house finished in autumn of 2008. I put that photograph on this blog in November, 2008. This time, it is the photograph taken in the spring of 2008 before modification construction. Ｔｈｉｓ is the appearance of those days chosen as the "ancient city scene prize"of Otsu city, Shiga prefecture. The peculiar window called Mushiko-mado window is the feature.The window on the right-hand side of the second floor corresponds to it. ※Mushiko-mado window means the latticed window of the mortar coating installed in the second floor that faced the passage. The reverse side of this house faces Lake Biwa. It is an alley which begins from the jizoudo and an old warehouse. If you pass through this alley, you will appear in the side of Lake Biwa. 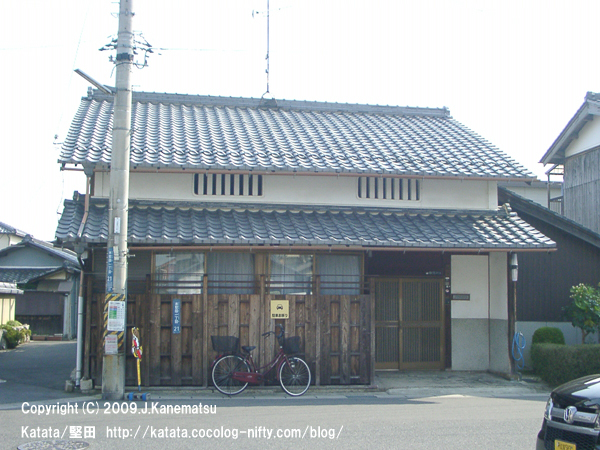 Jyunei-ji temple and Nami-no-Oto brewing are in the area of the point which passed through this alley. the temple which meets first is Myousei-ji Temple. Atmosphere changes from the hit of Myousei-ji Temple. the temple which meets first is Myousei-ji Temple. The next door is the Kanda shrine. A quiet residential street spreads to the circumference. It is the circumference of the Kanda shrine that there is certainly a jizoudo if you walk for a while. I introduce scenery with the jizoudo in Honkatata 1-chome. 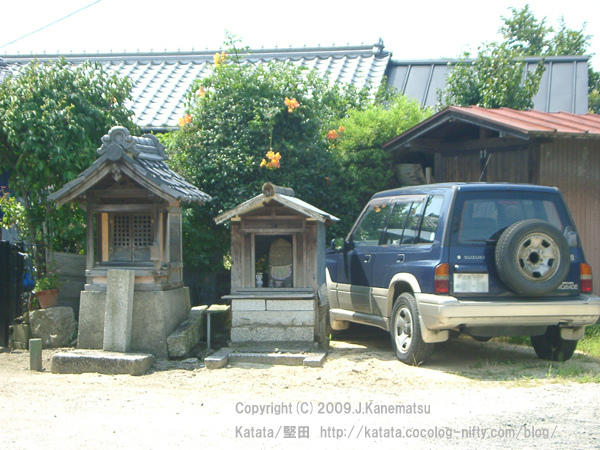 This is also one of the Machiya which remains in front of the gate of Honpuku-ji temple. This is also used as a private house. And there is an A window also in this house. A left-hand side alley is an alley which continues to the Koutoku-ji temple famous for the head of Mr.Genbe Katata. 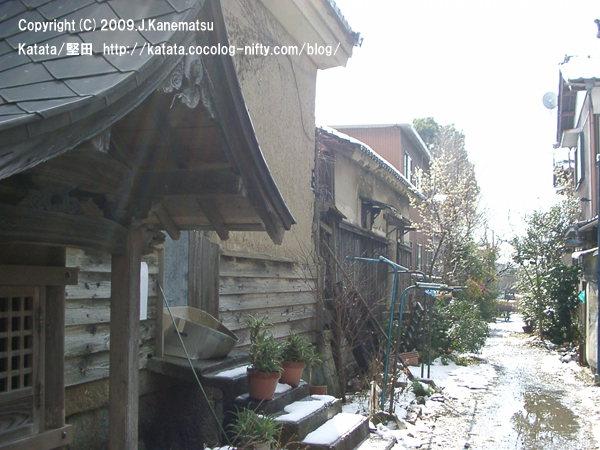 I introduced this alley and Mr.Genbe Katata in May, 2008. 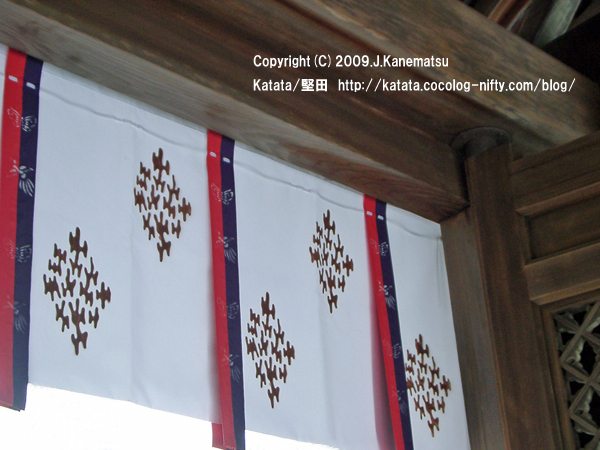 ※Mushiko-mado window means the latticed window of the mortar coating made in the second floor that faced the passage. 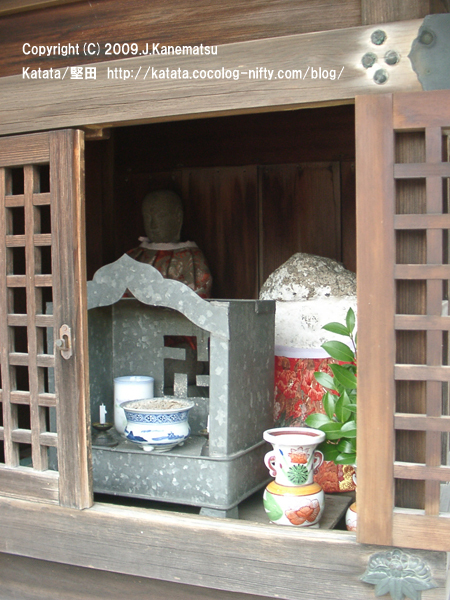 It is one of the Machiya which remains in front of the gate of Honpuku-ji temple. It is used as a private house. From now on, I will introduce some. Mushiko-mado window characterizes Machiya in Honkatata. Only a few goes into the back further by the middle. That is in front of the gate of Honpuku-ji temple. It is the neighborhood where atmosphere in which the world of a historical play is given remains. From the bus stop to Ukimido temple, it is a straight road. In the middle of the way, it turns left before the museum of Katata. Immediately . 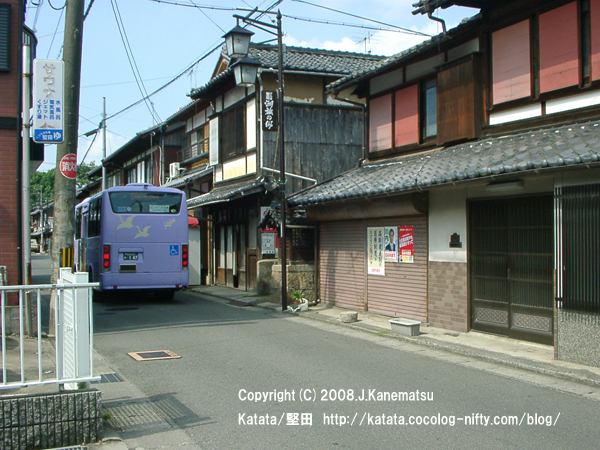 There is a bus stop called the Katatahonmachi. It is in the place of several minutes with a Katata town loop-line bus from JR Kataｔa station. 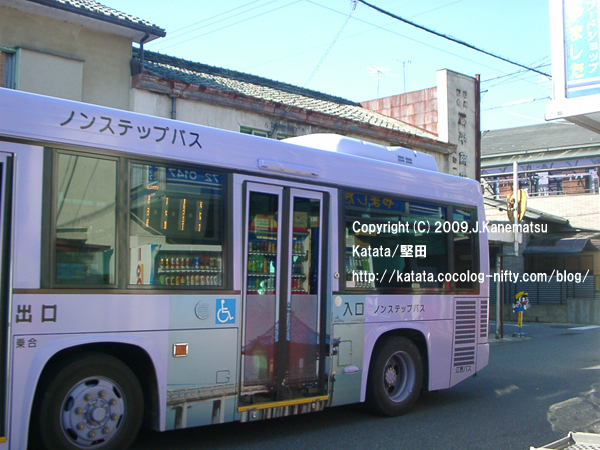 A Katata town loop-line bus is just going to run in the direction of the Katatademachi which is the next bus stop. 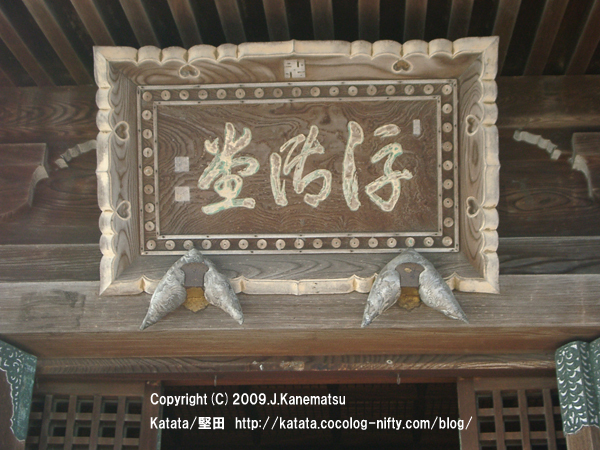 The direction of coming should get off by the Katatademachi to Ukimido Temple or Toyobo. 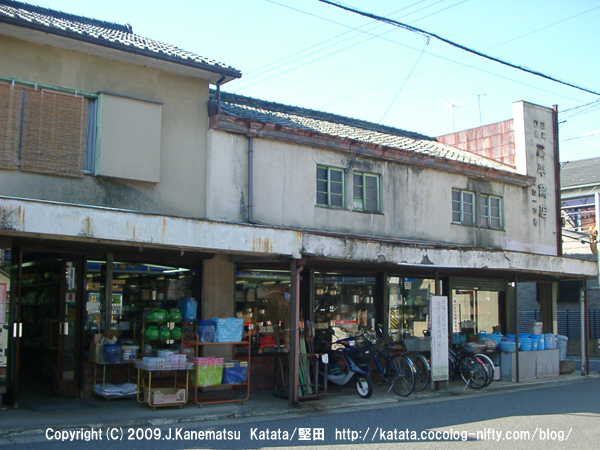 It is a Katata town loop-line bus which runs the Okahira store front. A photograph is a thing of the type with which Ukimido Temple is drawn on the body. It is in the place of several minutes with a Katata town loop-line bus from JR Katata station. 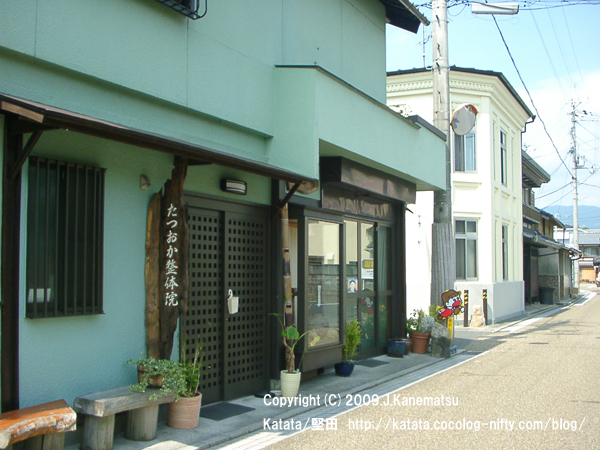 This is the Okahira store that presence is shown near the bus stop. This store is the hardware store. and there are rows of houses in which the atmosphere of Showa era remains. 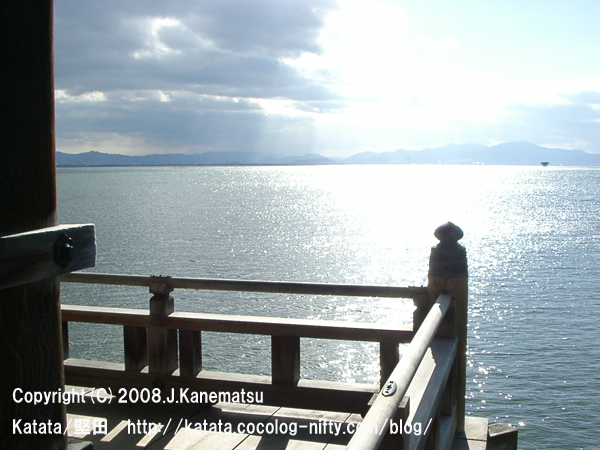 It is Lake Biwa in January seen from Ukimido temple. Amitabha of 1000 bodies called the "1000-body Buddha" are installed in this. The Kannondo of kaimonzan Mangetsu-ji temple. 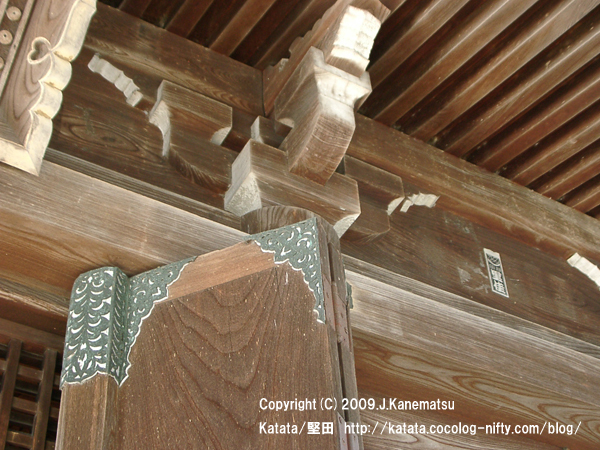 It is a registration cultural property in the Kannondo in the precincts of Ukimido temple. 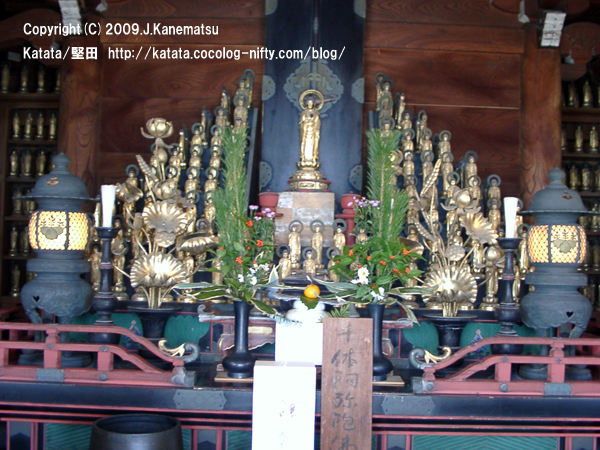 The splendid shrine in the Ukimido immediately side is the Izu shrine. 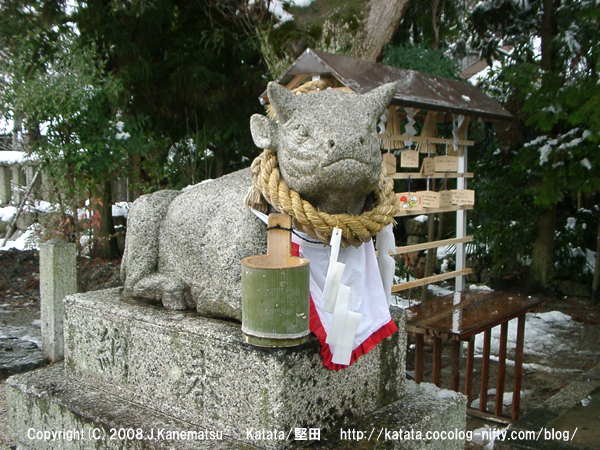 It is the sculpture of the cow made with the stone in the shrine. Since it can actually stroke, this sculpture is called the stroked cow. It is valued to local you. from 22 years old to 34 years old. He realized spiritual enlightenment on the beach in Katata. And he was given the name of Ikkyu from Soudon Kasou who was his teacher. 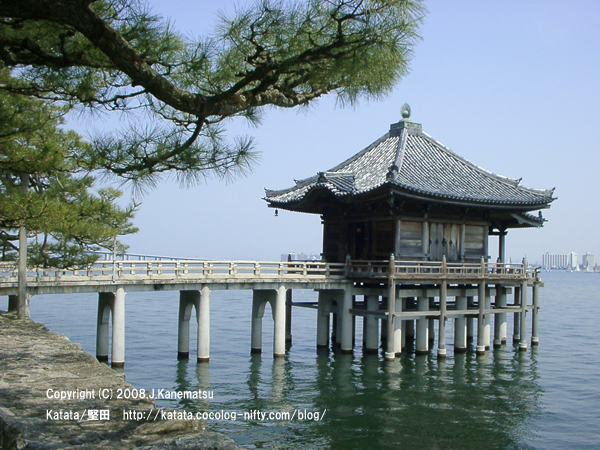 Ukimido is a temple built so that it may appear on Lake Biwa which is the biggest lake in Japan. This is a tree of the pine which is beside the bridge crossed to the Ukimido. 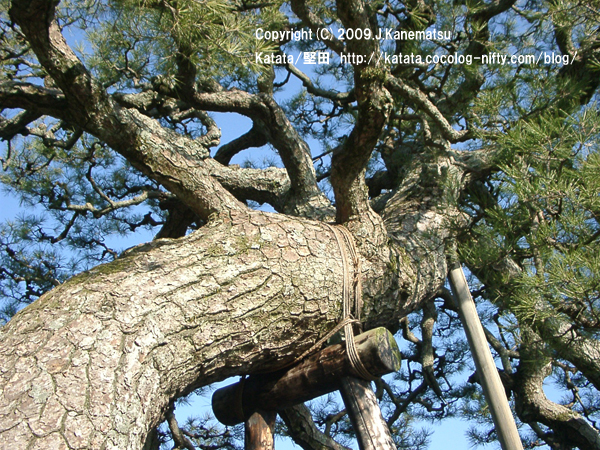 In Japan, it is believed that a pine tree is a good tree of luck.May it be one year good for you!